The fourth auction of the D. Brent Pogue Collection, named the "Masterpieces of United States Coinage, Part IV," realized $16,749,038. Part IV was presented jointly by Stack’s Bowers Galleries and Sotheby’s in New York City on May 24. Its more than $16.7 million total came from 61 lots for a per coin average exceeding $274,000, according to the two auction houses. 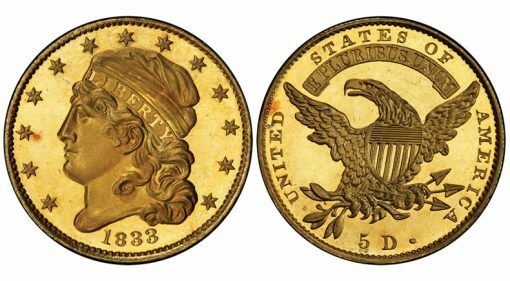 "At $85,318,218.50 the Pogue Collection is now far and above any other collection ever sold at auction in total proceeds," reported P. Scott Rubin, statistician for the coin hobby. "Eleven coins pedigreed to the D. Brent Pogue Collection Part IV will now be included in the Top 250 Auction records." The Farouk-Pittman 1833 Proof half eagle led sales at $1,351,250. A 1795 Draped Bust silver dollar also surpassed the million-dollar mark, hammering in at $1,057,500. 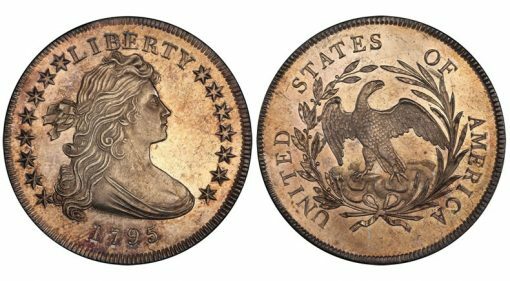 A record $10,575,000 was bid for the finest known 1804 silver dollar, the highest price ever offered for any coin, but the bid failed to meet the reserve price. 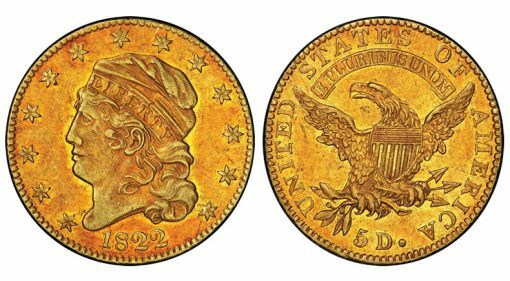 The only collectible specimen of the extremely rare 1822 $5 half eagle received a phone bid of $7,285,000, an amount surpassed among gold coins by only the 1933 double eagle $20 gold piece that realized $7.59 million in 2002. The level, however, did not meet the rarity’s reserve. This 1822 Capped Head Left Half Eagle received a bid for $7,285,000. That did not meet its reserve. A 1795 Draped Bust dollar brought $763,750. The same sum purchased an 1829 Large Planchet half eagle. The first half dollar of the New Orleans Mint, the extremely rare 1838-O, realized $493,500. The finest known 1838-C half eagle, struck in the first year of production at the Charlotte (NC) Mint, brought $235,000 against a $60,000-$90,000 estimate. For more information, visit www.stacksbowers.com. The two rarest coins in this auction didn’t even meet the minimum reserve bid! This Texas family’s collection is in the world record books already & they still haven’t sold the entire collection yet. Amazing! The third generation Pogue family members will keep its 1804 silver dollar since a record $10.5 million bid wasn’t enough for the greedy children! 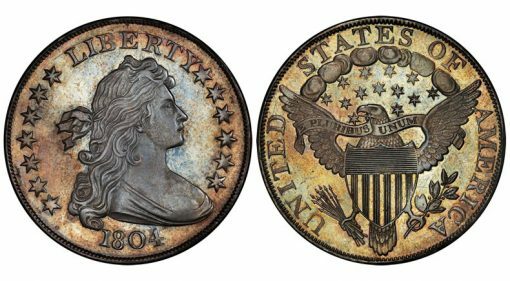 It would have been the most paid at public auction for any coin in world history, but they snubbed the offer leading to this headline: “Top rarities in Pogue IV auction fail to meet minimum reserve bid & don’t sell.” How sad. Is the hobby really in decline that much? There are 15 specimens of the 1804 silver dollar known. It is not that rare compared to US Mint unique coin specimens. But it does get the most press. Back to the safe deposit box it goes. Would like to know the reserve price? Joe – on my budget, I could only afford to pay face-value for the coin.